Chocolate candy recipes for kids are a great way to build relationships and store up memories. Whether you prepare the recipes with the children or surprise them for special occasions you will instill in them a sense of being loved. To this day, the kitchen seems to be the gathering place in my parents home. We have never had an overly large kitchen, in fact, it sometimes felt quite crowded! Nevertheless, the kitchen has always been, and, I suspect, always will be the heart of our home. I have lovely memories of learning to cook alongside my mother and sisters. If you have children of your own, don't pass up the wonderful opportunity to bind your hearts together with laughter and fun in the kitchen. I can't think of a better idea than to indulge in a bit of candy making with these chocolate candy recipes for kids! One of the easiest ways to make chocolate candy with kids is to use candy molds. There are so many different molds available in all different shapes and sizes. You can find almost every sort of animal, sport, flower, letters, numbers, you name it! Merckens makes specific colored candy melts that are so easy to use. You'll also discover that colored food dyes are available by both Wilton and CK Products that you can use to create custom themes or color schemes. It's a lot of fun to browse through the molds and supplies available at Candyland Crafts, and get started making fun candy creations with your own children. But wait! If you do decide to try your hand with chocolate candy molds, read the tips on how to mold chocolate candy as that will help you avoid some common mistakes and get the best results. Well, here they are so far. 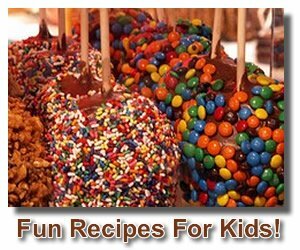 An adorable list of chocolate candy making recipes that children of all ages will love. Have fun! If you are like me and haven't been blessed with children of your own (you have my sincerest sympathies), don't feel left out! 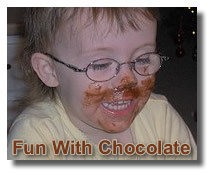 Find some children to share in these chocolate candy making recipes for kids. I have 22 nieces and nephews (and counting! ), as well as my Sunday School class, and children from Bible Club, etc. If you look around, I'm sure you will find some kids who would love to help you whip up a batch of goodies, or at least savor the delicious results! I have been looking for creative ideas for candy making with children because I am hopelessly uncreative (is that a word???). I have found a couple clever ideas that I am passing on to you, but, when it comes to chocolate, MORE IS BETTER. Add yours in the form below! Visit Cake Decorating Corner for more clever and adorable ideas for making kids birthday cakes and cakes for all occasions.